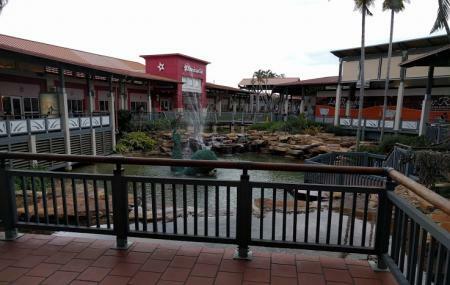 The Falls is one of the largest open air shopping centres in Miami. It offers visitors an extensive range of shopping, dining and entertainment options. True to its name “The Falls” is designed around a lavishly landscaped manmade lagoon, numerous fountains, waterfalls and ponds. There are more than 100 stores and restaurants located in this mall. The main anchors are Bloomingdales, Macy’s and the Regal cinema theatre. It is an ideal place for stress-free shopping in a picturesque setting. Dress according to the weather as the mall is open-air and exposed to the elements. There is plenty of parking and security available at hand. The fountains and green spaces are a good place to relax and take a break from shopping. How popular is The Falls? People normally club together Monkey Jungle and Biscayne National Park while planning their visit to The Falls. Absolutely adore this Mall. Every store and item for your everyday needs are available here. I come here to relax, to dine, to shop, to get phone repair and so much more. It is very safe and there is ample parking. Very pretty mall aesthetically. the fountains and artificial rivers they have running through most of the mall is really pretty and gives off a very relaxed vibe. It's nice to grab a snack and lounge around with a friend or two. the security is always patrolling and ensuring that the mall feels safe while the staff in charge of keeping everything clean also does a great job. there is an abundance of parking, and even during peak hours you can always find a nice place to park either in the garages or the lot. my only problem with this mall is that the movie theater isn't very good, It's decent for a night out, but not a particular favorite.